Project Re:Focus. Photo: David To. This student-led design-build project centers on the need to create new housing prototypes that are both sustainable and affordable. It is an entirely solar-powered dwelling, formed of modular components that can be configured in numerous arrangements to expand or shrink depending on the needs of the family unit or site constraints. The concept is structured around a set of rigid steel frames that resist lateral (wind/seismic) forces combined with structural insulated panels (SIP’s) that resist gravity and thermal loads. The two systems work in concert to form the basic enclosures of each module. The rigid frames wrap the outside of the thermal enclosure, minimizing the potential for thermal losses through bridging and also becoming a sub-structure for locally-acquired and site-specific materials to be applied to it. They also support a canopy of photovoltaic panels. The modules can be transported as complete units or separated and flat-packed for shipment by container or truck. To address the climate of the region, Cracker homes were porous by design, constructing both large and small fissures to allow for natural ventilation to occur. One specific variant of the Cracker house was the dog-trot, where the living and sleeping areas were shaped as separate modules, each placed under a larger continuous roof. The space between the modules allowed for sheltered outdoor living spaces and invited breezes to cool the homes. Project Refocus is a modern interpretation of these straight-forward design principles. The basic building block is the rigid frame, along with 8 feet wide x 16 feet long x 12 feet high modules. Three modules are combined to create Live/Work/Eat spaces; two modules are combined to create Sleep/Bathe spaces; one module remains open between them as a covered breezeway. The house uses heart-pine lumber salvaged from a historic home near Micanopy, Florida. The regionally-specific skins include exterior wood screens, integrated photovoltaic panels, and solar-thermal energy systems. The goal is to create armatures through which many architectures may grow. The construction system is designed to allow for mass-customization, where industrialized processes can be tailored to the region a home is to be constructed. The structure of the house is comprised of two interrelated systems: a rigid structural steel framework and a system of structural insulated panels (SIPs). The structural steel frames resist lateral (wind/seismic) forces while the structural insulated panels resist gravity and thermal loads. The two systems work in concert to form the basic enclosures of each module. As a completely solar-powered home, the project includes a roof mounted array and a vertically mounted array on the south façade. The roof mounted system is mounted on the structural steel frame above the roof surface and provides shading for the living module, breezeway, and bedroom module. This solar canopy prevents direct exposure of the roof to direct solar gain. Also, with the array covering the breezeway, it allows for shading this outdoor transition space, providing a gradual entry into the cooler living and bedroom areas. Overall this strategy reduces the load on the heating ventilating, and air conditioning (HVAC) system and enhances passive conditioning. The 12.42kW array installed on the roof in a 3 module x 18 module design uses close to the allowable maximum area. The 2.184kW vertical south wall installation is also maximized and uses technology that will produce more kWh per year per installed kW compared to conventional systems. There are two 6,000W inverters for the roof modules and one 3,000W inverter for the vertical modules. The roof-mounted array over the living module is connected to one 6,000W inverter and the roof-mounted arrays over the breezeway and bedroom module are on the second 6,000W inverter. The Solar Decathlon is a competition organized by the U.S. Department of Energy in which universities from across the globe meet to design and build an energetically self-sufficient house that runs only on solar energy, is connected to a power grid, and incorporates technologies that maximize its energy efficiency. In the final phase of the competition, teams assembled their prototypes at the Villa Solar in Madrid, Spain. The prototypes designed by the participating teams then competed in a set of ten contests (Decathlon) in order to demonstrate the self-sufficiency and energy efficiency of each house. 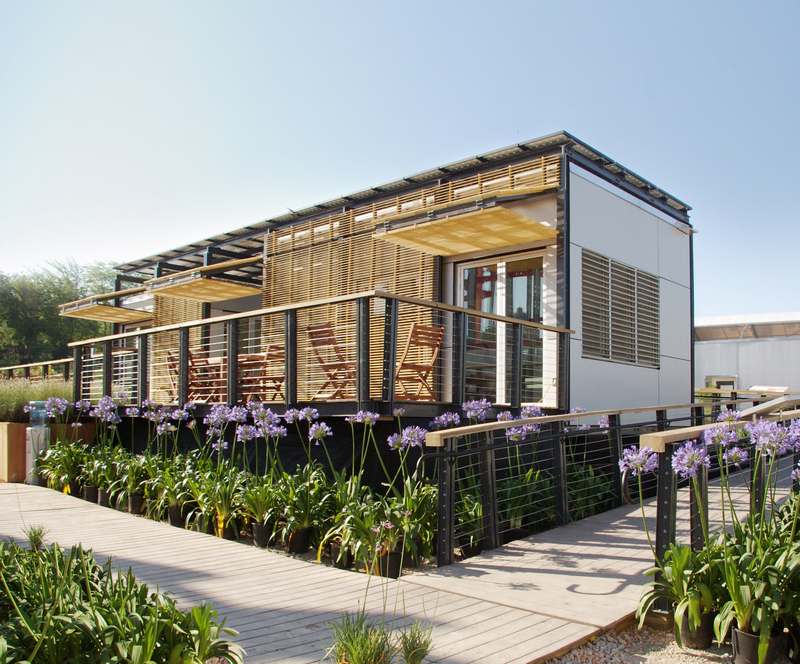 The Solar Decathlon brings prestige to the participating universities, because for them it involves the integration and generation of knowledge on the conditions of sustainable construction in an environmentally conscious world. The universities selected to participate in multidisciplinary work teams are led by a faculty advisor, a project manager and a team captain. The Ministry of Housing granted financial support, estimated at 100,000 Euros, to each of the participating teams in order to facilitate the participation of the universities. Solar Decathlon Europe 2010 offered students a unique opportunity for learning, taking theory and putting it into practice, and doing so through a very unique case study. Students working on the project were challenged to use their ingenuity and innovation, and their capacity to design and build a prototype of an energetically self-sufficient house. In addition, they learned about socio-economic constraints in order to ensure the viability of their project. For additional information about the project, go to http://studiowalters.com/portfolio/project-refocus/. Note: All architectural design work was completed as a collaboration amongst a group of faculty from the University of Florida, working with a student team of more than a hundred students over the course of two years. The project included participation of faculty and students from the College of Design, Construction and Planning, the College of Engineering, the College of Journalism and Communications, and the Warrington College of Business Administration. Faculty Advisors: M.E. Rinker, Sr. School of Building Construction: Robert J. Ries, Ph.D., R.A., James G. Sullivan, Ph.D., LEED-AP, Russell C. Walters, Ph.D., ASCE; School of Architecture: Mark McGlothlin, Bradley Walters, AIA, NCARB; Department of Interior Design: Maruja Torres-Antonini, Ph.D., LEED-AP. Robert J. Ries was the Principal Investigator; all other faculty members were Co-Principal Investigators. Principal Student Leaders: Dereck L. Winning (Primary Student Contact), Rachel Compton (Health & Safety Officer), Jeff Humpal (Construction Manager), Paige Mainor (Public Relations Contact), Alex Palomino (Instrumentation Contact), Jason Parker (Cost Estimator), Kevin Priest (Project Engineer), Chris Sorce (Project Manager), David To (Project Architect), Jordan Wise (Fire Watch Captain). Additional Student Team Members: Christopher Anderson, Clay Anderson, John Atkinson, Brooks Ballard, Jacob Beebe, Luke Booth, Christopher Chappell, Isaac Church, David Cowan III, Laura Ettedgui, Dale Freel, Amy Guidos, Andrew Herbert, Jeanette Holloway, Lantz Holtzhower, Katherine Huber, Aaron Hynds, Jake Landreneau, Chris Loft, Amy Long, Oscar Koeneke, Robert Lyons, Matt McKinnon, Laura Meeks, Robert Menasco, Geoffrey Miller, Ryan Moose, Sean Morgan, Michael Osterling, Ryan Padgett, Jacklyne Ramos, Alex Ruhnau, Max Scott, Wyatt Self, Jessica Tomaselli, Crystal Torres, Ian Trunk, Peter Vastyan, Marie Vogler, David Wasserman, Erin White, Randall Wilhoit, Amanda Young, Erika Zayas.